We estimate that, if current laws remain unchanged, the budget deficit this year will be close to $1.5 trillion, or 9.8 percent of GDP. That would follow deficits of 10.0 percent of GDP last year and 8.9 percent in the previous year, the three largest deficits since 1945. As a result, debt held by the public will probably jump from 40 percent of GDP at the end of fiscal year 2008 to nearly 70 percent at the end of fiscal year 2011. This is the 2011 fiscal projection from the Budget and Economic Outlook: Fiscal Years 2011 Through 2021 report. While the deficit gets better after 2011, the public debt becomes 76.7% of GDP by 2021. 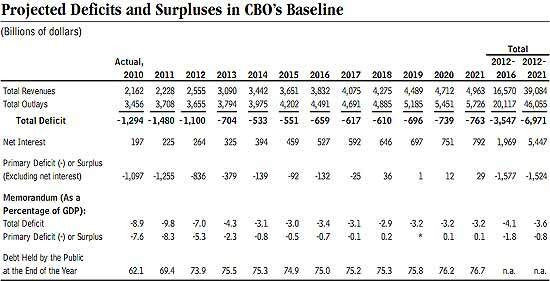 If current laws remain unchanged, as we assume for CBO’s baseline projections, budget deficits would drop markedly over the next few years as a share of output. Deficits would average 3.6 percent of GDP from 2012 through 2021, totaling nearly $7 trillion over that decade. As a result, the debt held by the public would keep rising, reaching 77 percent of GDP in 2021. Payroll employment, which declined by 7.3 million during the recent recession, rose by only 70,000 jobs, on net, between June 2009 and December 2010. You cannot reduce the deficit without increasing revenues and you cannot collect taxes on people who earn no money. They have a whole list of assumptions, most are current law, with a moderate GDP growth of 3% for 2011/2012. All of those policies have recently been extended for one or two years. If they were extended permanently, deficits from 2012 through 2021 would average about 6 percent of GDP, rather than 3.6 percent, and cumulative deficits over the decade would be nearly $12 trillion. Debt held by the public in 2021 would rise to almost 100 percent of GDP, the highest level since 1946. The CBO site also has interactive graphing tools for deficit projections if current laws are changed or made permanent. The United States faces daunting economic and budgetary challenges. The economy has struggled to recover from the recent recession: The pace of growth in output has been anemic compared with that during most other recoveries and the unemployment rate has remained quite high. Federal budget deficits and debt have surged in the past two years, owing to a combination of the severe drop in economic activity, the costs of policies implemented in response to the financial and economic problems, and an imbalance between revenues and spending that predated the recession. Unfortunately, it is likely that a return to normal economic conditions will take years, and even after the economy has fully recovered, a return to sustainable budget conditions will require significant changes in tax and spending policies. For crying out loud. PAY DOWN YOUR DEBT! No they won't as the neo-classical economic orthodoxy prevails - the US will 'band-aid' to the day of reckoning and until that day it will speed up the printing presses and its print baby print. Register and get an account. You write comments almost every day and if you get an account, you bypass all of the CAPTCHA, comments are immediate, cool stuff appears to track your own comments, see if anyone replied and makes for real discussion. You add great stuff, might as well sign on. No kidding, they are out to impose "austerity" which is really screw what ever is not nailed down that helps the middle class, social safety nets, anyone but the uber rich and incorporated "beings". This is why I did and other writers on this site and elsewhere were screaming over the tax cuts to the rich. FOMC was no change, including QE2, which I did not bother to post it was so expected there was nothing to comment on. That said, the real bastards screwing this country to oblivion are the corrupt government "representatives", past, president, red & blue. Such complementary colors red and blue, assuredly by the same outfit. that makes sense. Hopefully Churchill's quote about the U.S. doing the right think after exhausting all other possibilities will come true. We need revenue very badly. Why is this even possible! We should only give the politicians the ability to debate what percentage of revenue gets spent, up to 97% The idea of a budget deficit should not even be a possibility. Today there was talk by the GOP that 100 Billion was too much of a cut when we should be looking at cutting 1.5 trillion or whatever it takes to only spend as much or a little less than we bring in. How long can an American family spend twice as much than they earn before it is time to pay the piper!